Pre-K & Preschool theme ideas for learning about forest animals, trees, and leaves. How trees look: bark, leaves, etc. Trees as habitats for animals and insects. Tree products: nuts, fruit (apples), etc. How trees change during the seasons. Forests are homes to plant and animal life. We take a leaf walk around the schoolyard and nearby park to observe and collect various shapes and colors of leaves. We notice the trees they come from. Children put their collections in a ziplock bag. We go on a leaf hunt around the school grounds to collect leaves. Children study the leaves with magnifying glasses, and draw pictures of different leaves with a fine-point black ink pen. I choose one leaf drawing from each child, scan it, enlarge it on the computer, and print them out on white art paper. I print several copies for each child. The children decorated the leaf copies with different materials: watercolor paints, tempera paints, fine point colored pens, markers, and colored pencils. One year, my class decided on their own to create a huge tree “as big as the wall”. They drew the tree on sheets of posterboard, mixed their own paint to paint the tree, and made branches for it. The leaf artwork that children made went onto the branches. Some of the leaves were painted, some were decorated with colored markers and pencils, and some were made with art sand. We “adopt” a tree in the schoolyard each year. I chose a pear tree because it has very visible changes in every season: green leaves in summer, red leaves in fall, bare in winter, and white flower buds in spring. Each season we go outside to draw the tree. I take a photo of the children standing in front of it every season. During one of our group discussions, we made this chart to record our predictions of what colors the leaves on our “adopted” tree might be in the Fall. Our first pear tree drawing is done in the Summer (August) when the leaves are green, and we made this chart then while discussing what we thought would happen. Children make trees with paper towel rolls and construction paper. After we read the book, A Tree is Nice, and talk about different kinds of trees, we paint a picture of a tree. We use a long, narrow piece of paper for our tree painting to resemble the tall shape of trees. (The pages of the book, A Tree is Nice, are also long and narrow.) We have brown, green, red, orange and yellow paint available, and I add pine-scented oil to the paint for fun. We graph leaves that children collect outdoors by color and/or type. Each child collects one leaf to graph. Leaves from a single tree can also be graphed when the leaves are changing from green to another color. Some children might collect green leaves, some might collect red, and others might collect leaves that are two-toned. I used a leaf craft puncher to cut out the pieces from construction paper. Children glue the cutouts on the paper pattern strip. You can do AB, AABB, ABC, ABB, AAB, etc. Print the Pattern Grid Sheet here. I used leaf craft punchers to cut out the pieces from construction paper. Print out the numeral sheets. Have children count out the correct amount of paper cutouts to glue onto the numeral. Print the Large Numeral Sheets here. This is a set of tree figurines from a Safari Ltd. “Toob”. We use them in the science center. Children work in pairs. One partner holds a piece of paper against a tree while the other child makes a tree bark rubbing with the side of a crayon. Then the partners switch roles so that each child has a turn to make a rubbing. In advance, collect a variety of things that you find close to one tree (or a few trees that are close together) in the schoolyard: bark, nuts, pine needles, pinecones, leaves, small branches, etc. Bring the children out to that same tree(s), show them each item one at a time, and have them find that item on the tree (or on the ground below the tree). After reading the book Owl Babies, we look at the pictures in the book and talk about the art (the owls and the black night painted around them). Children use oil pastels to draw a picture of the baby owls (white) and the mother owl (brown). Some children just draw the owls and some children draw the owls sitting in the tree. They paint over the picture with black watercolor paint, which turns the picture into a nighttime picture. Listening activities help children learn to listen for specific sounds. One child is chosen to be the owl, and turns away from the class. Children take turns being the owl. One child in the group is handed a squeaky toy, and everyone holds their hands behind their back. The “owl” turns around, and tries to find the squeaking mouse. Real owls can hear a mouse squeaking from a long distance away. After reading the book, Owl Babies, children drw a picture to illustrate some aspect of the story. They dictate a “retelling” of the story for the teachers to write on the page. Read the blog post about story retelling. Use bat rings to cover the letter/number/shape on the bingo cards. We use these to play alphabet bingo, number bingo, shape bingo, or rhyming bingo. Children work in pairs. Each pair of children has one sock and 4 bat rings. One child puts 0-4 bat rings into the sock (without the other child seeing), and the other child slips his hand in to count the bats without peeking. Children who have difficulty counting blindly can slip each ring onto a fingertip. We use several shades of multicultural paints and a special “paintbrush” (cotton ball clipped in a clothespin). The children dab the paint onto their paper, making sure to make a body, arms, legs, head and ears. Later we add wiggly eyes, pompom nose, and yarn mouth. Children use a paper plate that is divided into six sections (I drew lines on the plate to make the sections). They sort a bag of Gummi bear candy by color, putting each color into one section. This is an activity we do on Teddy Bear Day. After we read Goldilocks and the Three Bears, we sort the children’s teddy bears by size (Papa bear, Mama bear and Baby bear). Children spread peanut butter on a pinecone or a bagel half and sprinkle on the birdseed. We put these in ziplock bags with string so the children could take them home and hang them. If any of the children are allergic to peanuts, we make a bird feeder with a folded paper box or milk carton, which the children can decorate, and scoop the birdseed into the box. 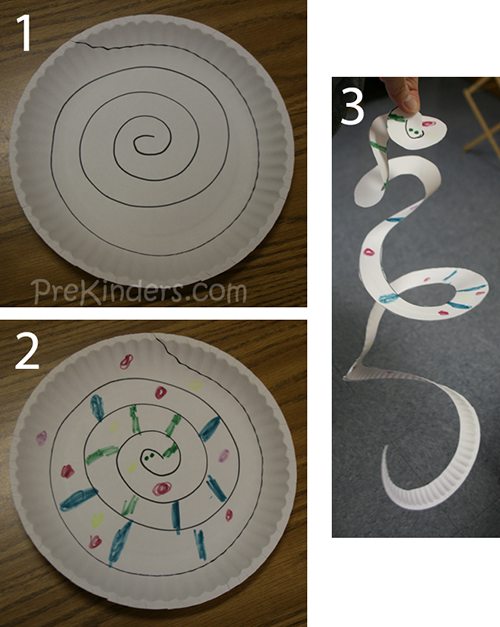 Children decorate a paper plate with a spiral drawn on it. They cut the spiral to make the snake and draw eyes on the snake’s head. Children roll the play dough to form snakes. They form snakes of different lengths to learn the vocabulary: long and short. After practicing with the play dough, children also make snakes with Model Magic and paint them. Each child in the group has a jar of mice (beans painted and decorated to look like mice). We read the story, Mouse Count, and count the mice into the jar just as the snake does in the story. We use an edible play dough recipe and form it to make snakes. We add mini M&M’s for eyes. *Substitute Sunbutter in place of peanut butter if any children in the classroom are allergic to peanuts. Children assemble the mitten and cut out the animals from Jan Brett’s website (“Put the Animals in the Mitten” activity). The children put each animal into the mitten as the story is read to them. As a group, children try to recall the order of the animals. We go on a nature walk to find things, such as sticks, leaves, acorns, pebbles, birds, squirrels, etc. Children mark a checklist when they find each item. The children are also given a small ziplock bag to collect items they find. Read about and print the Nature Walk Checklist here. Read about and print the Leaf Bingo Game here. Read about and print the Forest Animal Pattern Blocks here. Would you like to join my FREE weekly update newsletter? Join 80,000+ subscribers!